BD-RE or Blu-ray Disc Rewritable is a high capacity, high definition optical media storage disc format that can withstand multiple erasing and re-recording. BD-RE comes in various storage capacities—a single layer holds 25GB or approximately 4 ½ hours of HD footage while a dual layer disc holds 50GB of data, or approximately 9 hours of HD footage. 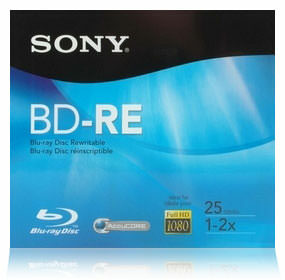 The basic construction of a BD-RE disc is similar to other Blu-ray disc formats with some exceptions to compensate for its re-recording abilities. It starts with a spiral grooved polycarbonate substrate followed by an alloyed silver reflective layer to help the BD device’s laser beam read data. Next, a phase changing alloyed recording layer that alters between crystalline and amorphous states is flanked by dielectric layers that remove excess heat from the recording element. The phase changing of the recording layer determines whether the data is read, recorded, or erased. These layers are topped with a polycarbonate-based cover layer and a clear protective coating that prevents scratches and other damage. A double layer BD-RE disc has a more involved construction process. It shares a grooved, polycarbonate substrate, a metallic reflective layer, a phase changing alloyed layer, and a cover layer like the single disc. However, the double layer includes four dielectric layers, an additional phase changing layer to record data, and a spacer layer. The spacer is a uniquely developed adhesive that reacts to pressure to imprint an additional groove track. The dual layered disc is also protected by a clear, hard coating. At 1x, a BD-RE will write at a speed just over 90 minutes for a single layered 25GB disc and 46 minutes at 2x for 25GB. Higher writing speeds can also transfer data at speeds of 72Mbps. The Blu-ray Disc Association has introduced four versions of its rewritable disc format thus far. Currently, consumers are using the fourth version, BD-RE 5.0. The price of current BD-RE discs is still relatively high, but some users can justify the cost by considering their returns in quality and storage. Prices for these discs start around $2.50 a disc.